Frank Tanabe : The Two-Way Frank Tanabe, who was in a California internment camp when he volunteered to serve in the U.S. Army, was 93. 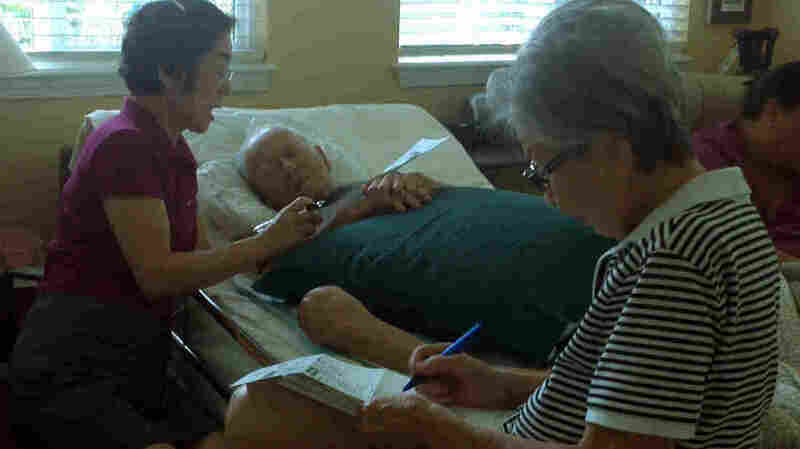 A photo of him voting from his deathbed went viral this month. Oct. 17: Frank Tanabe, center, casts his vote with help from his daughter Barbara Tanabe, left, and his wife Setsuko Tanabe. Frank Tanabe, the 93-year-old World War II veteran who wanted to cast one more vote and inspired thousands when a photo of him doing that from his deathbed went viral, has died. The Associated Press reports that Tanabe's daughter Barbara Tanabe said he died Wednesday at her Honolulu home, where he has spent the past few weeks in hospice. Tanabe had liver cancer. "Honolulu elections officials say Frank Tanabe's vote will be counted unless they receive his death certificate before the Nov. 6 election. Even if they do receive the certificate, it most likely won't be practical for elections officials to pick out his ballot from the thousands of absentee ballots mailed in." The laws on what happens to votes cast by those who die before Election Day vary from state to state.